Thank you Peter for your wonderful design and advice in building our wine cellar. 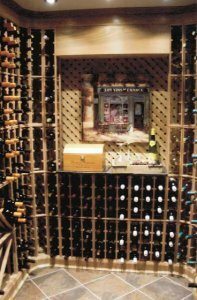 The redwood wine racks were easy to assemble and the wood quality was excellent. While your product is suited for the do-it-yourselfer, of which I am not, (I chose) to have it professionally done. Thankfully, Carmine an exceptionally skilled carpenter and friend did an amazing job for a truly professional result.